Geomembrane Patch and Seam Tapes | GeoCHEM Inc.
SEAMING AND REPAIR OF LINERS WITH TAPE: For those projects where it is impractical to make the cover in a single sheet, multiple panels are used which require field seams. If extrusion welding seams is not feasible or not required, another approach to field seaming is the use of Aggressive Seaming/Patch/Repair tape. Taped seams cannot provide the same level of performance as those obtained by factory or welded seams. Therefore the performance requirements of the taped liner should be considered verses other seaming methods. Double sided bituminous tape which is applied between the overlapping panels. Single sided tape secures the exposed top edge of the top panel to the second panel. The surfaces which will receive the tape should be clean and dry. The tape will not adhere or give the level of performance required if the surfaces are not properly prepared. Dirty or wet surfaces should be completely cleaned with water, paper towels, dry rags or other materials which will prepare the surface for the tape. Accumulations of dust should also be removed to insure a secure sealed seam. Both of the products used obtain their optimum adhesion when the surfaces to be bonded are warm. The surfaces should be at least 60°F to insure an acceptable bond. In order to obtain a bond at lower temperatures, external heat may be required. The use of an industrial style hot air blower (i.e. Hot Air Gun) is one recommended method. Extra care should be taken when attempting to place Tape at temperatures below 32°F. To install tape, the overlapping top panel edge should be pulled back approximately one foot. A row of double sided tape should be placed about 2’-3’ away from the edge of the bottom panel. The tape should be applied as straight and as uniformly as possible. The tape should be allowed to follow the contours of the panel and should not be stretched tight. If fold-overs exist in the material, they should be smoothed prior to placement of the tape. Applying firm pressure ensures that the tape is sealed to the material. Once the first row of tape is installed, place a second row of double sided tape approximately 2” away from the first row following the same steps as for the first row. After the second row of double sided tape has been installed, the release paper should be removed from both rows of tape and the top panel secured to the bottom. Again, do not pull the material tight during the securing process since excess tension will eventually result in numerous wrinkles which are difficult to seal. All voids or wrinkles, if they exist, should be sealed with double sided tape. The exposed edge of the panel can now be secured to the bottom sheet with a layer of single sided tape. Again, the material should be clean and dry. Apply the single sided tape so that half of the tape is on one panel and half on the second panel. Press into place and insure that the tape is secure. After completion of the seams, the seams should be inspected to insure that sufficient adhesion has been obtained in all areas. 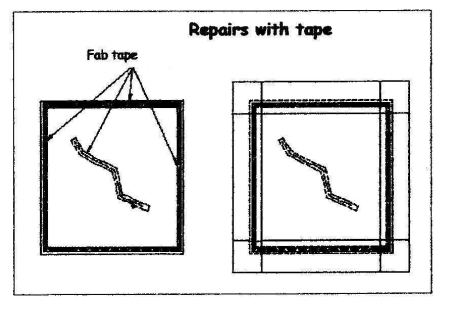 If the tape has not adhered, the tape should be resealed and/or replaced if the tape has become contaminated from dirt or other foreign substances. The liner should then be positioned as necessary to insure that during operation the liner/liner seam will not be under tension. 1. The area where the welding (tape) is to occur should be clean. All dirt or residue must be totally removed from the weld (tape) area. After removal of these deposits, the surface can be cleaned with isopropyl alcohol. 2. Seaming surfaces must be free from moisture. If the weld (tape) area is wet or damp all moisture must be removed. Additionally, field seaming cannot be performed during rain or drizzle or snow conditions. 3. The ambient temperature should be greater than 45 degrees Fahrenheit. Lower temperatures produce greater difficulties in achieving an effective weld (tape). If welding (taping) is required below this temperature seam integrity should be closely monitored. 4. The liner and patch material should be as positioned as required minimizing the amount of wrinkles or folds in the weld (tape) area. Care should be taken to insure that sufficient material is positioned as necessary to insure the liner will not be placed under tension during use. Thermal contraction during cold weather should also be considered. 5. Test welding (taping) should be conducted in an area of the liner where the function of the liner is not affected. If the weld (tape) is acceptable on the patch material and not on the existing liner, the surface of the existing liner may need to be butted or sanded. The surface can be buffed with 150-200 grit sandpaper. The extent of preparation will be dependent on the condition of the liner and the type of seam required. Once an effective field seam is obtained, repairs or patching should be performed utilizing similar conditions. 6. Non-destructive evaluation of field seams be performed utilizing Air Lance Testing for taped seams (repaired/seamed) and per ASTM D 4377 “Standard Practice for Determining the Integrity of Field Seams Used in Joining Flexible Polymeric Sheet Geomembranes” Standard-Practice-for-Determining-the-Integrity-of-Field-Seams-Used-in-Joining-Flexible-Polymeric-Sheet-Geomembranes. Thermally Bonded Seams - includes Taped Seams.